EILAT, Israel (Reuters) - For 50 years an Israeli oil company kept bathers and scuba divers away from a prime strip of beach in the Red Sea resort of Eilat. But it couldn't stop the sea life. A spectacular and diverse reef, undisturbed by the splashes of three million beach-loving Eilat visitors each year, blossomed. The corals made the oil pipeline and a simple docking pier their home. A year and a half ago the 300 meter-long beach was handed back to the public after the Eilat Ashkelon Pipeline Company (EAPC), whose facilities are gated off and subject to military secrecy, scaled back its operations. Scientists found a magical undersea world of unspoiled corals and schools of fish. Faced with huge visitor interest in the virgin site, Israel's Nature and Parks Authority decided to relocate the corals for their own protection so the industrial debris left by EAPC could be removed. "The most complicated part of opening this beach is preserving the wealth of species in this unique spot, while still allowing the public to enjoy the natural treasure," said Assaf Habary, manager of the Eilat region for the nature authority. Coral reefs are home to an estimated 25 percent of all marine life. They are under threat worldwide by climate change, pollution and unregulated fishing and tourism, so saving each piece is important. 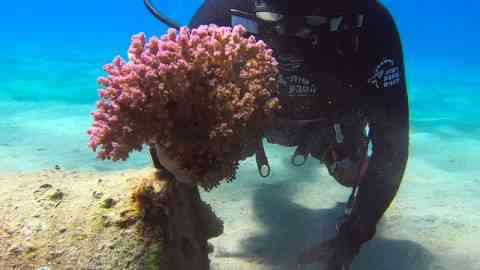 "There are hundreds of colonies of coral that we need to relocate, one by one, delicately," Habary said. Watched by a passing dolphin, he and his teammate used hammers and chisels to gently chip the richly colored corals off cement barrels and pipes half-buried in the seabed. Enough tapping at the base of the coral and it simply peels off. The collection of corals, ranging from the size of a baseball to a basketball, were then floated down shore and placed on a natural, hard surface they would hopefully adopt as their new home. Roughly one-quarter of coral reefs worldwide are already considered damaged beyond repair, with another two-thirds under serious threat, according to the World Wildlife Fund. In Eilat, however, aquatic life seems to be bucking the global trend. Scientists have found coral here can tolerate unusually large rises in temperature, while those elsewhere are turning white and dying as oceans warm. They believe the corals that settled thousands of years ago in the northern Red Sea had to pass through a narrow strait of warmer water that acted as a thermal barrier, ensuring they are more resilient to temperature increases.